When the National Baseball Hall of Fame inducted its first class of players in 1936, Ty Cobb received more votes than any other player--even more than did fellow inductee Babe Ruth. Cobb, known as the Georgia Peach, was universally recognized as the best player from the dead ball era. He also had the reputation of being its most ferocious player. 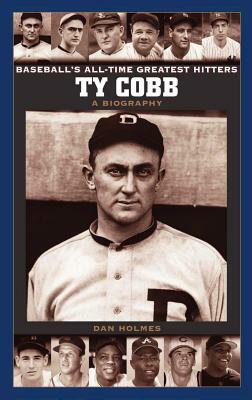 His fierce determination to succeed helped Cobb equal or surpass more offensive records than any other player, and his career average of .367 is still the highest of all time. Cobb's unyielding and often ferocious work ethic, though, made him many enemies, and his occasional episodes of violence marked an otherwise impeccable career. Baseball author Dan Holmes offers a fresh and fair-handed look at the life of baseball's first true superstar. It has been said that hitting a baseball is the hardest thing to do in professional sports. Baseball's All-Time Greatest Hitters presents biographies on Greenwood's selection for the 12 best hitters in Major League history, written by some of today's best baseball authors. These books present straightforward stories in accessible language for the high school researcher and the general reader alike. Each volume includes a timeline, bibliography, and index. In addition, each volume includes a Making of a Legend chapter that analyses the evolution of the player's fame and (in some cases) infamy. DAN HOLMES is Web Manager for the National Baseball Hall of Fame and Museum in Cooperstown, N.Y. He writes articles for the Hall of Fame Web site and publishes Inside Pitch, the Hall of Fame's weekly email newsletter.